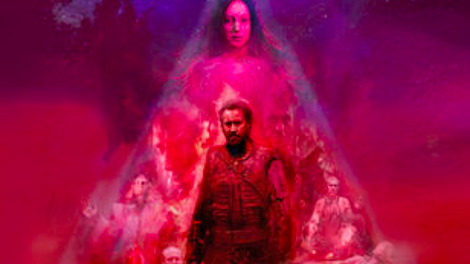 Although the film’s aesthetic owes just as much to bad-trip ’70s psychedelia, the phrase you’ll hear most often when describing the psychotronic new Nicolas Cage vehicle Mandy is “heavy metal.” (In his review for The A.V. Club, Ignatiy Vishnevetsky says it has “enough vintage MTV fog machines to kill a hair metal band.”) Part of that can be explained by the setting—the ’80s, the most metal decade—and part by the iconography: The title character, played by Andrea Riseborough, wears a Black Sabbath shirt in a key scene, and of course there are the biker skeletons to consider. 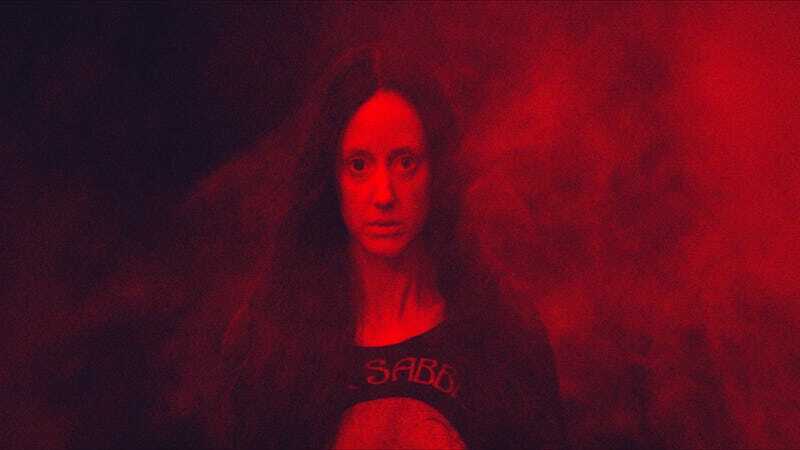 But the third, and perhaps most crucial, element to Mandy’s ineffable metal-ness isn’t visual. It’s Oscar-nominated composer Jóhann Jóhannsson’s score for the film, which embraces ambient doom metal both as a musical genre and as a general concept. The Mandy soundtrack was the last piece of music Jóhannsson completed before his death in February of this year. (According to his manager, he was working on it right up until the film’s debut at Sundance.) Jóhannsson’s death was an accident, so any ominous portents one might read into the music will be similarly accidental. It’s tempting to try, though, as “Dive-Bomb Blues” and “Waste” heave forward with the slow gait of some diabolical beast, its feet bound with clanging percussive shackles. Same for the black-metal-influenced guitars that rain down midway through “Sand,” or the distorted fuzz that gathers like storm clouds at the beginning of “Black Skulls” before being split in two by blissful, grating noise. This heavy, rock-influenced sound was a new direction for Jóhannsson, achieved with the help of two doom-metal luminaries: Sun O)))’s Stephen O’Malley on guitar, and co-producer Randall Dunn (Boris, Wolves In The Throne Room). In true rock ’n’ roll style, Jóhannsson’s original plan was to record the soundtrack live to tape, with a nine-piece band and a room full of synthesizers “set up for anyone to jump on,” as Dunn tells Pitchfork. That plan didn’t work out, but the soundtrack—which was produced separately from the musical cues for the film itself—is very much a rock album in spirit. “Jóhann felt very strongly about not just dumping 42 cues on a CD. He wanted it to be a standalone listening experience,” says Pepijn Caudron, who compiled the soundtrack after Jóhannsson’s death from a cue sheet and material from his hard drive. And it is, forming a complete musical arc that parallels the emotional beats of the film. After an ominous doom-metal fog rolls in on opening track “Seeker Of The Serpent’s Eye,” Mandy retreats into lush, sustained layers of romantic synthesizers on “Starling” and “Mandy Love Theme,” which stretches out a simple, lovely musical phrase over four and a half shimmering, dreamlike minutes. (That phrase will recur in penultimate track “Memories,” reminding Nicolas Cage’s character—and the audience—of his lost love.) The album gets heavier in tandem with the film’s escalating action, conjuring up images of a gigantic subwoofer blowing away the ethereal opening tracks in a cloud of red-clay dust. Then, finally, Mandy’s third musical through line—a John Carpenter-style synthesizer melody—kicks in. “Forging The Beast” in particular is a pulsating synth-based instrumental more reminiscent of a Cliff Martinez soundtrack than a Jóhann Jóhannsson one. It’s also there in “Children Of The New Dawn,” which was released as a single before the Mandy soundtrack came out alongside the film on September 14; you can hear where Jóhannsson’s been in the gently undulating guitar line, and where he’s going in the luxuriant instrumentation. In a statement accompanying the soundtrack announcement, Mandy director Panos Cosmatos says, “Jóhann went above and beyond, and I suspect to the limits of his sanity, to make the music for this movie.” And we’ll never know if the soundtrack’s dark sound reflects some terrible visage Jóhannsson saw staring back at him from the void. But we do know that it marks a turning point in his musical style, an embrace of the lush and layered as well as the heavy and metallic. Realizing that, and thinking about what could have come next, makes his death all the more tragic. Nicolas Cage on going full Nicolas Cage in Mandy: "It is something I surf with"